Making chicken noodle soup from scratch is so delicious. Learn how to make amazing flavorful broth and perfect egg noodles! Try it today. 1 cup all purpose flour approximate, enough to make a soft dough. 3 chicken breasts bone in, skin on. See notes for substitutions. Combine all the noodle ingredients, adding the flour gradually until a soft dough forms. Roll or press out to desired thickness, I like the dough to be about 1/8 inch thick. Cut about 1/4 inch thick with a pizza cutter. Separate them slightly and allow them to dry while you prepare the soup. Place chicken, vegetables, herbs, and bullion cube into the water. Bring to a boil and then reduce to a simmer. Simmer until the chicken is cooked through and tender and the vegetables are tender. Carefully remove chicken from the pot and pick it from the bones. Once finished, make sure all the pieces are bit sized (run your knife through them if they aren't) and add them back to the soup. Bring back to a boil and add the homemade noodles. Simmer until the noodles are cooked through, about 5 minutes. 4-5 chicken thighs or 4-5 chicken drumsticks can be used in place of chicken breasts. Or a combination of your favorites. The soup has more flavor if the meat has both the bones in and the skin on. Turkey can also be used in this recipe. 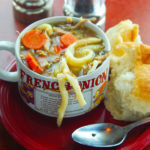 You can also make chicken noodle soup from scratch after making Homemade Chicken Broth.